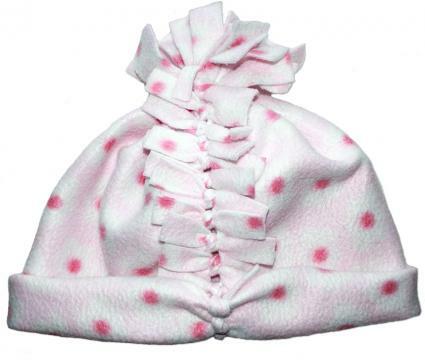 You don't have to own a sewing machine or even pick up a needle to create fleece hats for the whole family. No-sew fleece hats are easy to make, and they're a cozy winter alternative to scratchy wool or allergy-inducing down. 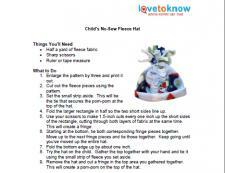 Print this free pattern for a child's no-sew hat. Free patterns make it easy and affordable to create a fleece hat. Your only investment will be the small amount of fleece required to make the project and about a half an hour of your time. These patterns are sized to fit most kids and adults. If you need help downloading the patterns, check out these helpful tips. 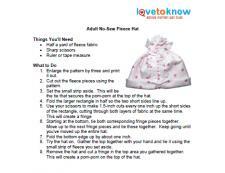 Print this free pattern for an adult no-sew hat. Before you begin, take a moment to choose a pattern. The child-size pattern fits most kids up to the age of 12. The adult-size pattern fits the average adult head. Fleece has some stretch, and you can also adjust the size by tying the fringe tighter or looser. Once you've chosen the adult or child size, click on the image of the pattern to download it to your computer. Enlarge the pattern by three and print it out. Cut out the fleece pieces using the pattern. Set the small strip aside. This will be the tie that secures the pom-pom at the top of the hat. Fold the larger rectangle in half so the two short sides line up. Starting at the bottom, tie both corresponding fringe pieces together. Move up to the next fringe pieces and tie those together. Keep going until you've moved up the entire hat. Fold the bottom edge up by about one inch. Try the hat on. Gather the top together with your hand and tie it using the small strip of fleece you set aside. Remove the hat and cut a fringe in the top area you gathered together. This will create a pom-pom on the top of the hat. Whether you're a veteran crafter or you're new to creating garments, these no-sew fleece hat patterns are a great alternative to hauling out the sewing machine. If you love this project, you can even make a fun no-sew scarf to go with it, giving you a complete look. No-sew fleece patterns are quick, easy, and creative.